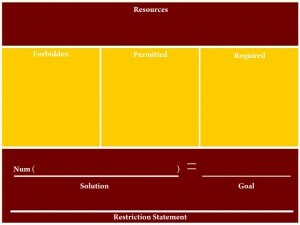 In the game of On-Sets the four sections of the playing mat that are most important are Goal, Required, Permitted and Forbidden. The only cubes that go on the Goal section of the mat are digit cubes. You can move one, two, or all three digits to use in the Goal. Any cubes not used to form the Goal should be placed in Forbidden. They cannot be used as your regular move. For more information on making Goals, read the post on Setting On-Sets Goals. On your turn you can move one cube from Resources to either Required, Permitted or Forbidden. If a cube is moved to Required, then it has to be used in your Solution. Any cubes in Permitted may be used in your Solution, but it’s not necessary. Finally, all cubes moved to Forbidden cannot be used to solve the Goal. In the course of the game it is possible to have say one B cube in Required and one in Forbidden. That just means that you have to use one B, but you cannot use that second B in your Solution. Now, the Resources section of the mat does not have to be used to hold the cubes rolled. Plus, the Solution section of the mat should never be used, because removing the cubes from the other sections of the mat where they were moved can cause confusion when checking Solutions.